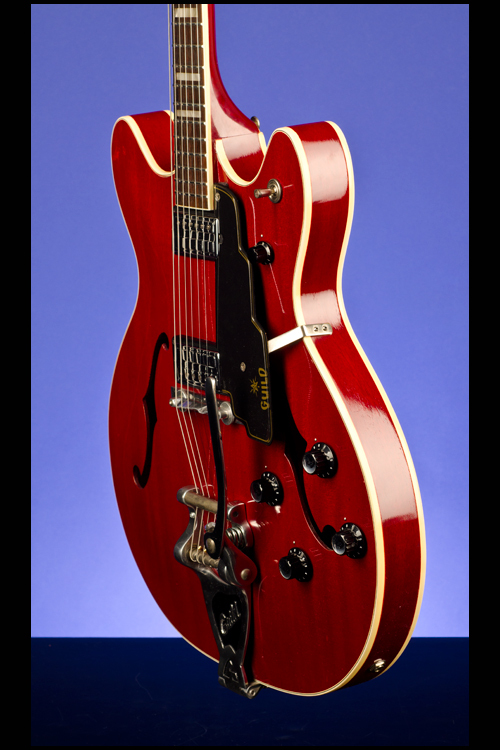 Starfire V Guitars | Fretted Americana Inc. This super guitar weighs just 7.90 lbs. 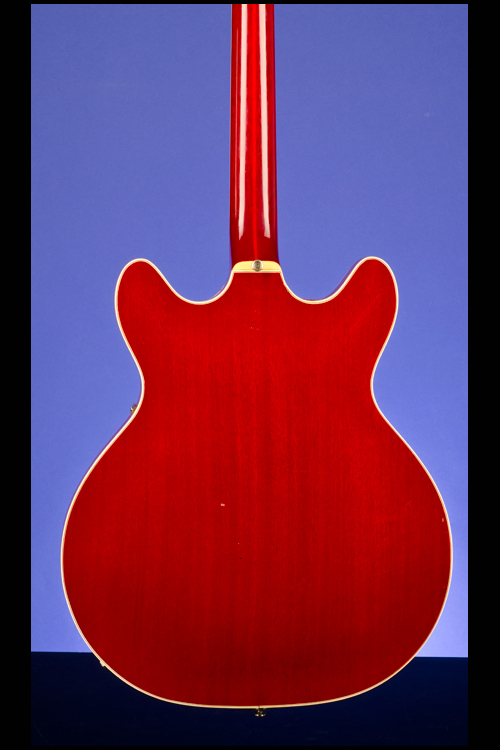 and features a mahogany body with a solid wooden block inside. Three-piece mahogany and maple neck with a nut width of just under 1 11/16 inches, a scale length of 24 3/4 inches and a wonderful medium profile. Single-bound rosewood fretboard with 22 original medium-thin frets and inlaid pearl block position markers . 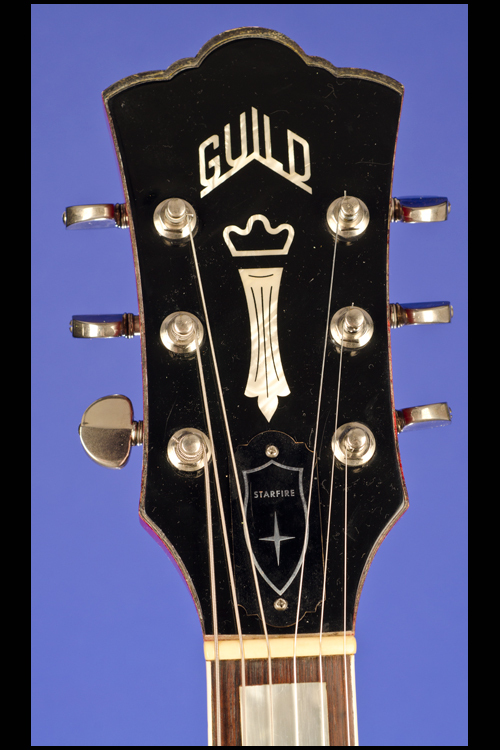 Headstock with inlaid pearl "Guild" logo and pearl 'Chesterfield' inlay. Specific shaped black aluminium truss-rod cover with "Starfire" in silver, secured by two screws. 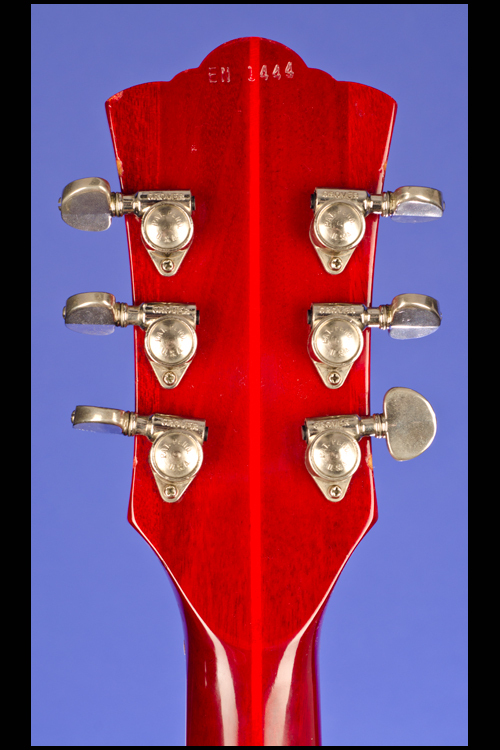 Serial number "EN 1444" stamped in blind on back of headstock. Individual Grover RotoMatic tuners with half-moon metal buttons. The top and back edges are bound with three-ply white and black ivoroid. Two Guild HB-1 (full-size) humbucking pickups with outputs of 7.11k and 6.45k. The pickups are positioned to achieve maximum bass on the neck pickup and maximum treble on the bridge pickup. Transparent acrylic (or Lucite) stairstep pickguard painted black from the underside after a "Star" and "Guild" logo have been silk-screened in gold. Four controls (two volume, two tone) plus three-way pickup selector switch and one master volume control (on the treble horn). Guild black plastic control knobs with "G" logo on a silver disc (the master volume control is just plain black plastic). 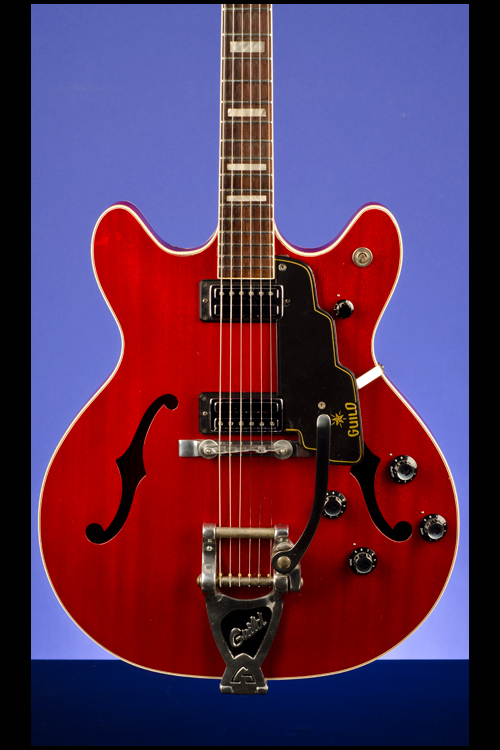 Height-adjustable aluminium bridge with pre-set compensating aluminium saddle and Guild Bigsby Vibrato tailpiece. All hardware nickel-plated. Inside the bass 'f' hole is the oval white Guild, Hoboken, New Jersey label with model "Starfire V Ch." and serial number "EN 1444" written in black ink. There are a couple of small blemishes on the top and the back and one on the bass side of the body. 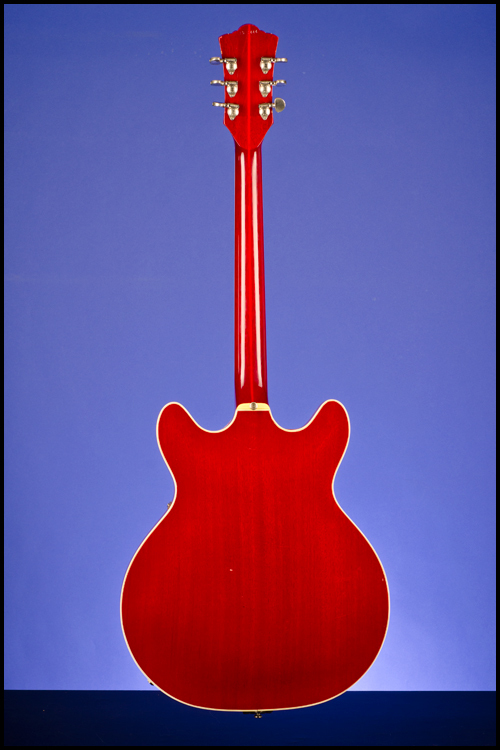 There is some light belt-buckle scarring on the back (nothing through the finish) and a few very small surface marks on the edges of the headstock. 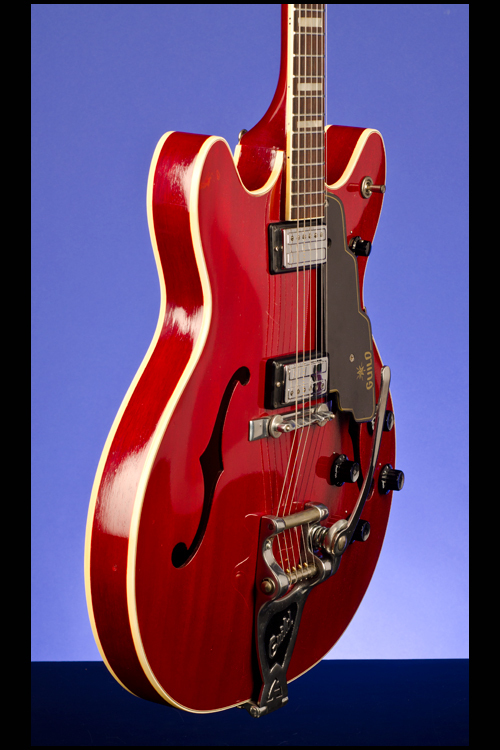 Overall this forty-seven year old, rare Cherry Mahogany guitar is in exceptionally fine (9.00) condition. 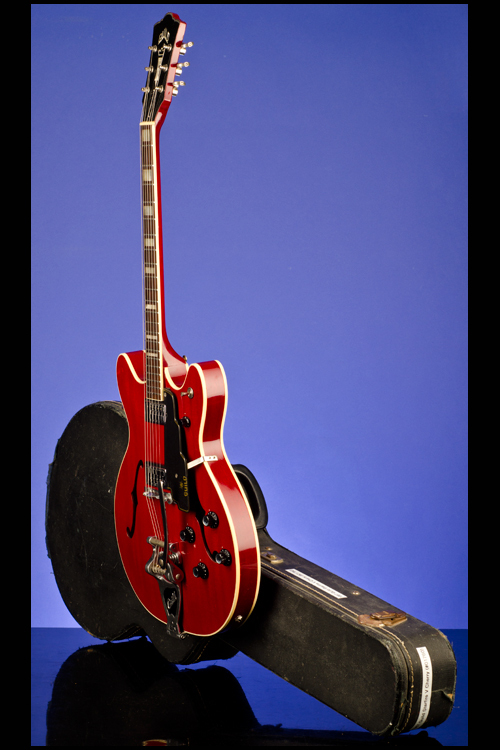 Housed in its original Guild five-latch, shaped black hardshell case with dark blue plush lining (8.50). 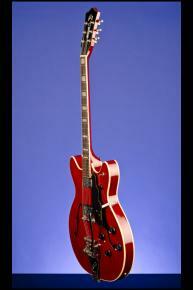 "In late 1963 two new models were added to the Guild line [the Starfire IV and the Starfire V]. 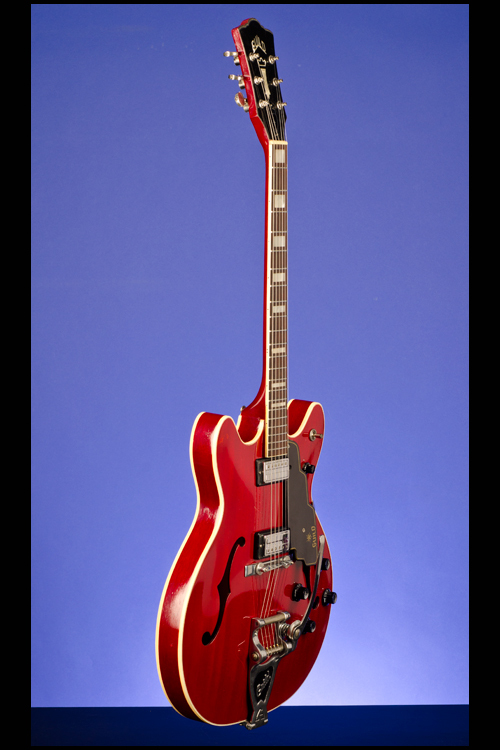 They were similar to the double-cutaway models that the Gibson company had come out with in the late '50s and which were becoming extremely popular. At the suggestion of Mark Dronge Guild came out with their version of a thinline semi-hollowbody guitar. Apart from the double cutaways, they were also different in construction from the single-cutaway version in that they had a block of wood on the inside of the body. This block that connected the top and the back of the instrument, ran from the neck to the tailblock. It was put there to reduce feedback and to give the instrument more sustain... 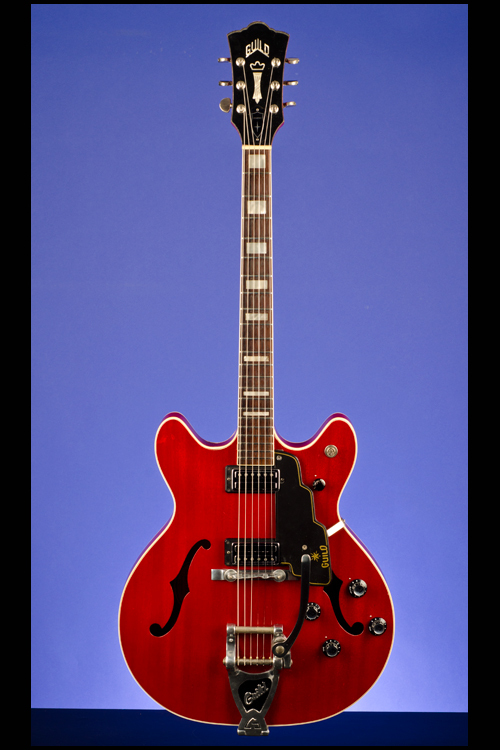 The Starfire V, launched shortly after the SF-IV, was similar but had a few extras like a Bigsby, a master volume and the more deluxe Kolb tuners… The instrument had an all-maple body, usually with very attractive grain, although some instruments with mahogany bodies have been reported." (Hans Moust, The Guild Guitar Book, pp. 87 and 89).